This phrase mixes “sitting duck” (someone vulnerable to an attack) and “shooting fish in a barrel” (ridiculously easy). 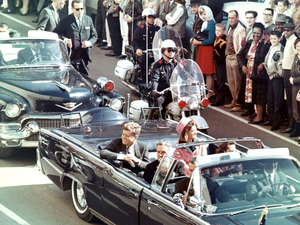 A big thanks to Michael Ameel for hearing this one on a radio program recently about the Kennedy assassination. An expert on the show indicated that JFK was an easy target, and blurted out this malaphor. It is similar to the 1/16/13 entry, “It’s like shooting ducks in a barrel”. Love this one. Always wondered where shooting fish in a barrel came from. Never seemed like it would be that easy. Great one, Ron. Foot in the door and toe in the water, right?